Alison is the beautiful, flirtatious young wife of the carpenter. When Nicholas woos her, she thinks nothing of her marital obligations and has no guilt at having an affair with the dashing young scholar. She is also somewhat temperamental: even though she sings sweetly to Nicholas, she harshly rebuffs Absolon’s advances. 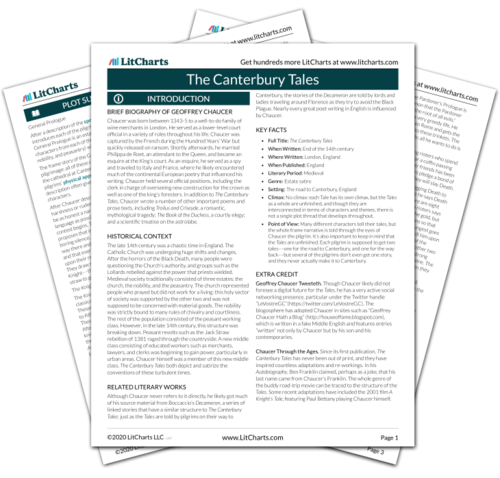 The timeline below shows where the character Alison appears in The Canterbury Tales. The colored dots and icons indicate which themes are associated with that appearance. Raphel, Adrienne. "The Canterbury Tales Characters: Alison." LitCharts. LitCharts LLC, 8 Nov 2013. Web. 25 Apr 2019. Raphel, Adrienne. "The Canterbury Tales Characters: Alison." LitCharts LLC, November 8, 2013. Retrieved April 25, 2019. https://www.litcharts.com/lit/the-canterbury-tales/characters/alison.